Online ordering menu for PUCCINO'S LAKESIDE. 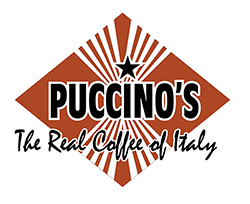 Come to Puccino's where we serve the finest Italian coffees, signature soups, salads, and sandwiches! We have everything you need to get your caffeine fix. Try our Cappucinos, Macchiatos, or Expressos among many other coffee favorites. If you're hungry, have one of our bagel sandwiches or Egg Biscuits for breakfast. For lunch, we have delicious sandwiches and/or wraps. Check out our full menu now! We are north of I-10 near Grace King High School. Find us in the Lakeside Shopping Center! Order online for carryout!